Putting aside the obvious come-back this ad invites (tell Senator McCain it’s not 1938), what are people supposed to take away from this bizarre ad? I thought it was an Obama ad. Then I looked more closely and realized McCain is trying to play off of his line at the debate about not being George Bush (if he’s not George Bush, then why does he talk about him so much?). That’s the “joke” – it’s not 2004, Bush isn’t running for president this time. 3. Please tell Senator Obama what year it isn’t. And John McCain wonders why he’s losing. Dear heaven it even uses the Obama logo in the ad. And it says “this isn’t 2004”? Of course it isn’t; the Republicans are going to get mass-murdered at the polls the way we SHOULD have done it then. The 2004 line is so stupid for many reasons but the one no one has pointed out is that if McCain is such a Maverick why did he not run in 2004? McBush is clearly showing signs of desperation.. God help us all if he wins next month. Sue him? He should THANK him for the free advertising! 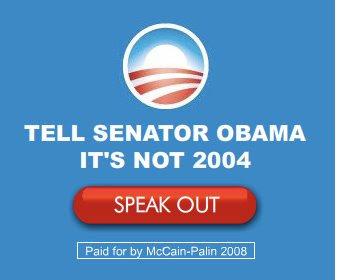 Like a big fat Obama yard sign, the McCain campaign just plastered the Obama-blue color and logo up, reinforcing the brand. Most of what we register is the visual, not the convoluted “message”. It’s a classic ad-gaffe. Tell Senator Obama It’s not 2004?? I don’t get it.What does this mean? I wonder if the rising sun flag logo is trademarked. If it is, Obama should sue him. Pretty much the whole approach of the GOP has been copy-cat this cycle.